Beagles are basically a healthy breed, but there are some problems that you need to be informed about. The most common problems with beagles are epilepsy, allergies, cherry eyes,hypothyroidism, hip dysplasia and back problems. Reputable breeders screen their breeding stock for problems and make educated breeding choices. While most of the health problems cannot be totally eliminated from the breed; a reputable breeder will do their best to breed away from the problems. You can check the Orthopedic Foundation for Animals site to see if the breeder participates in available screening tests. Reputable breeders provide a health guarantee as a part of their puppy contract. Many owners have questions about vaccinations, heart worms, spay/neutering and etc. 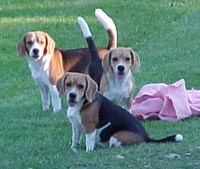 Links are provided below for detailed information about health concerns and beagles. If are interested in an overview of canine genetics please visit the "Breeding Info" section of this website. Bookmark this site now or use the back button to return from the provided links that are off this site. HYPOTHYROIDISM What is CHERRY EYE?